Ready for some fun? 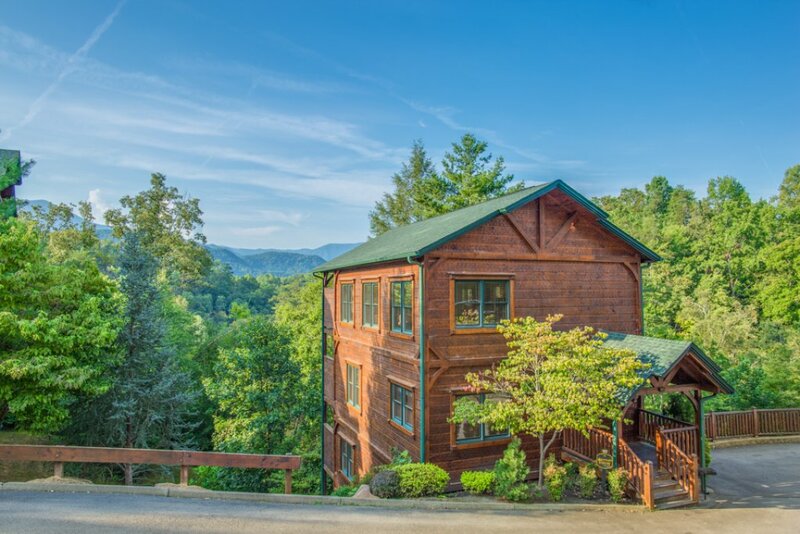 Then Gatlinburg Majesty is the place for you. 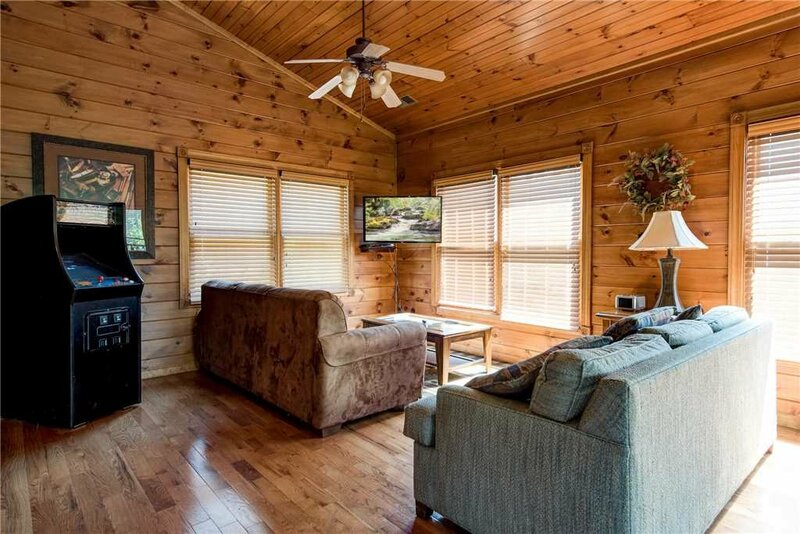 The four-bedroom log cabin is only minutes from the attractions of downtown Gatlinburg and the Great Smoky Mountains National Park. 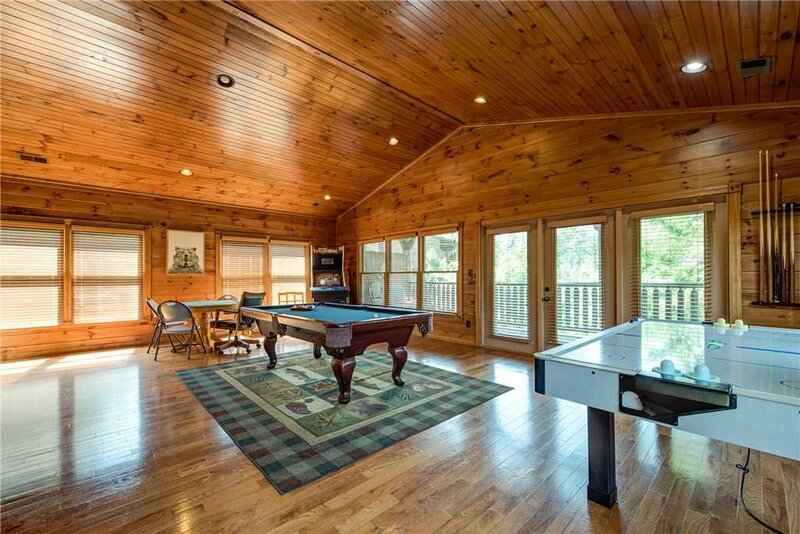 Just as important, there’s plenty of fun to be had in the cabin itself, which includes a pool table, air hockey, arcade games, and a hot tub. 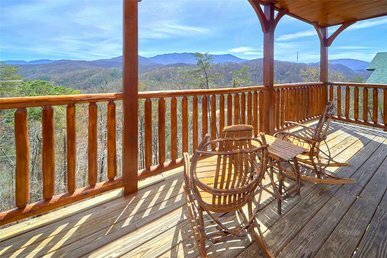 Each of Gatlinburg Majesty’s three covered decks looks out over towering trees to the Great Smoky Mountains. 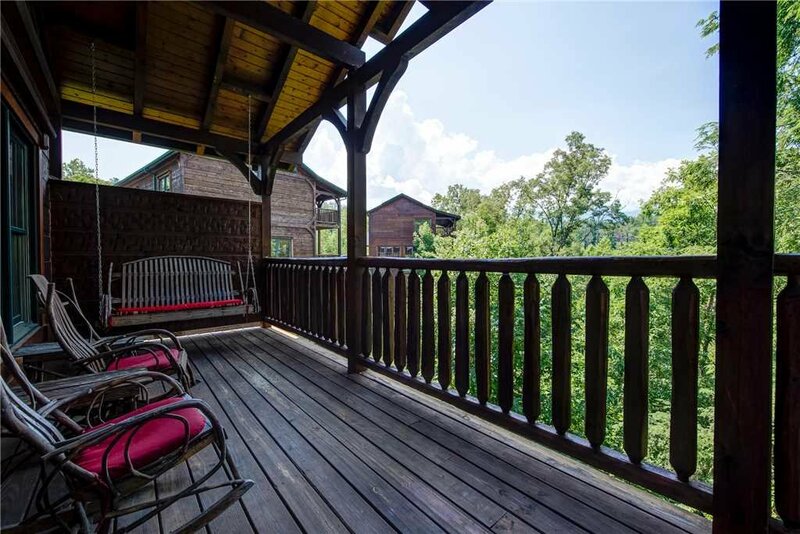 You can relish the view from their numerous rocking chairs, a swing, and best of all, a hot tub. 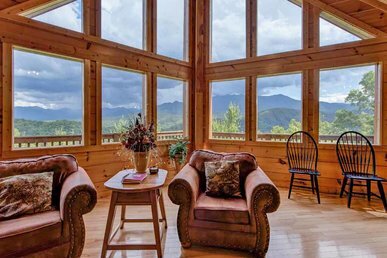 Start your morning with breakfast out in the seating area while watching falcons soar over the mountains; end it luxuriating among the hot tub’s relaxing bubbles as whip-poor-wills and owls serenade beneath a canopy of stars. 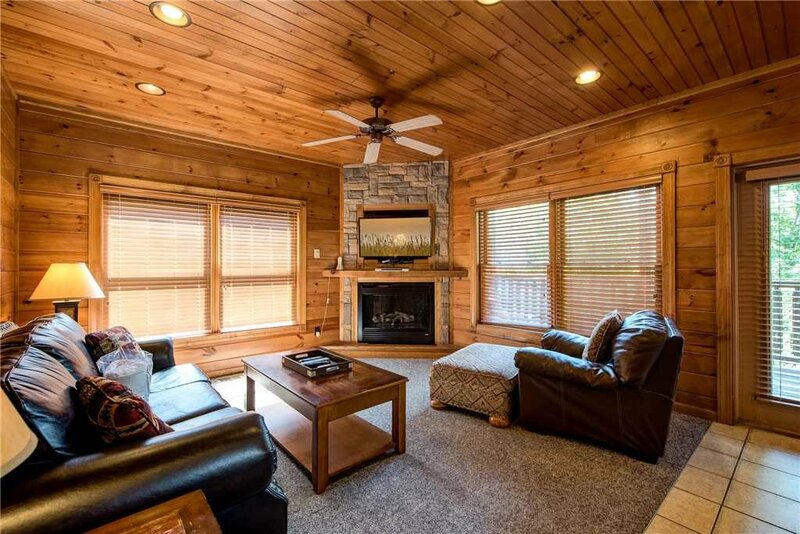 Back indoors, the living room on the main floor is also designed for relaxation. Spread out on the sofa and watch TV, curl up in the armchair with a stack of magazines, or gather by the fireplace to play charades. 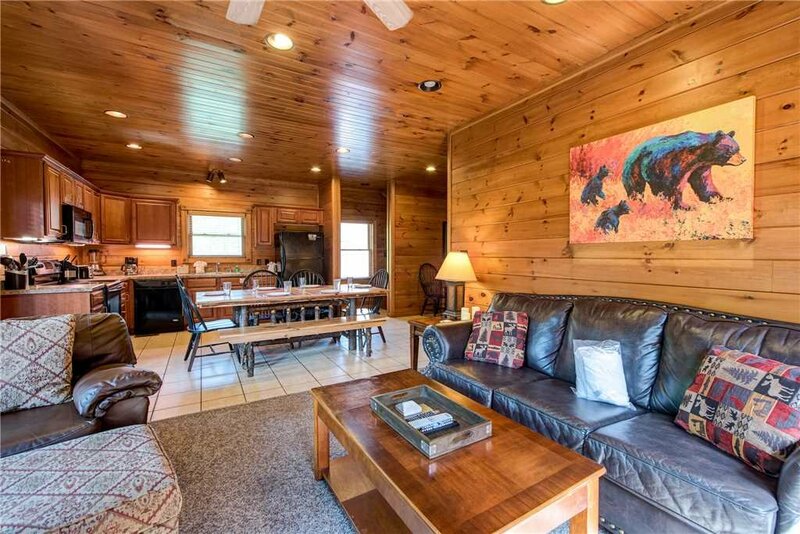 Or perhaps you want to congregate in the dining area to play board games while enjoying a snack: The log-style table seats eight. It’s adjacent to the kitchen, which is equipped with all the appliances, cookware, and tableware you’ll need to prep and serve three square meals a day—though given how many restaurants are just a quick drive away, you’ll probably be dining out at least some of the time. For more fun and games, head upstairs to the spacious game room. Shoot pool at the full-size billiard table, challenge the kids to air hockey, try your hand at the two game arcades (one of which is a Golden Tee golf game), sit down for a round of rummy or Uno at the poker table, or simply kick back on one of the couches and watch TV. 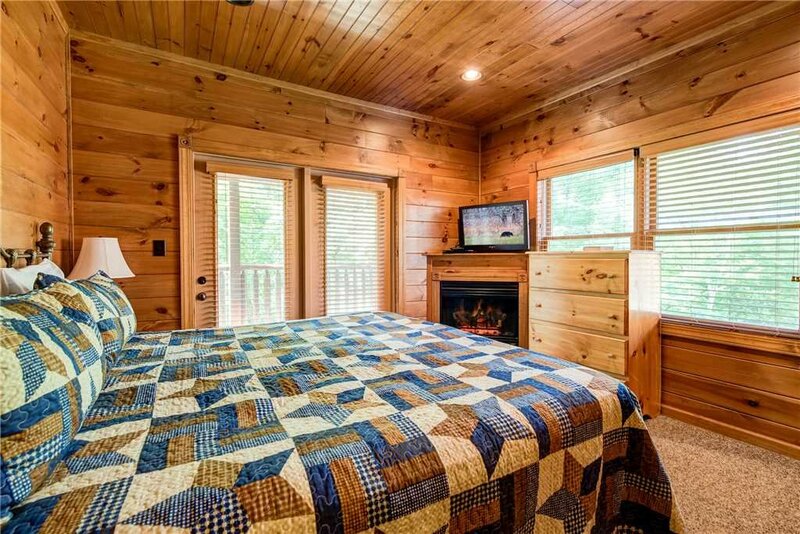 The game room can also sleep up to four people: two in bunk beds set off to the side and another two on a queen-size sofa bed. 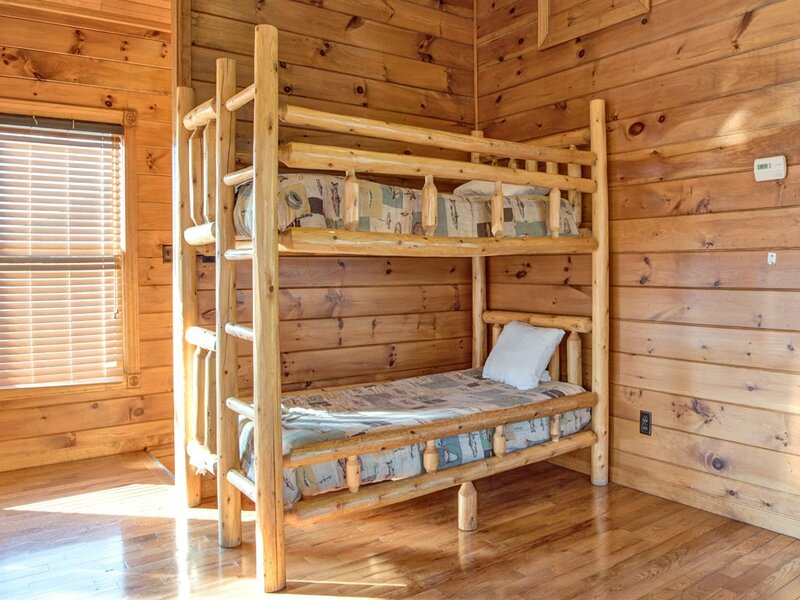 We’re sure the kids in your group will beg to be allowed to sleep here: Wait till they tell their friends that their bedroom had air hockey and arcades! The four “proper” bedrooms are on the other two floors. Three bedrooms make up the downstairs level, and the fourth is on the main floor. 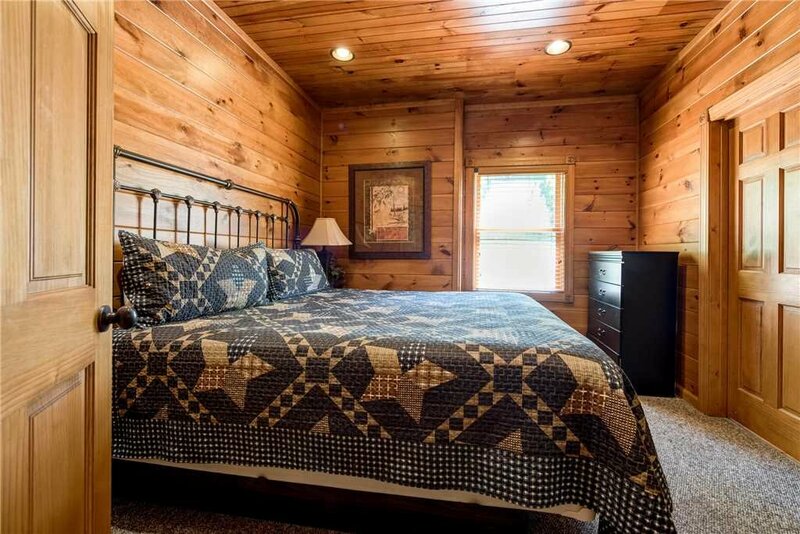 All four bedrooms have a king-size bed, making Gatlinburg Majesty as well suited for several couples vacationing together as it is for a family (or several families). 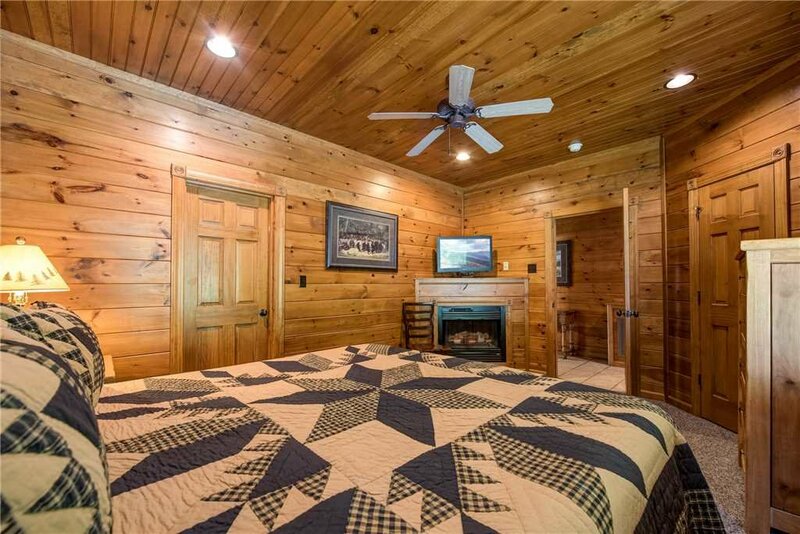 Several of the bedrooms have fireplaces, which will surely help create a romantic ambiance on chilly winter evenings. 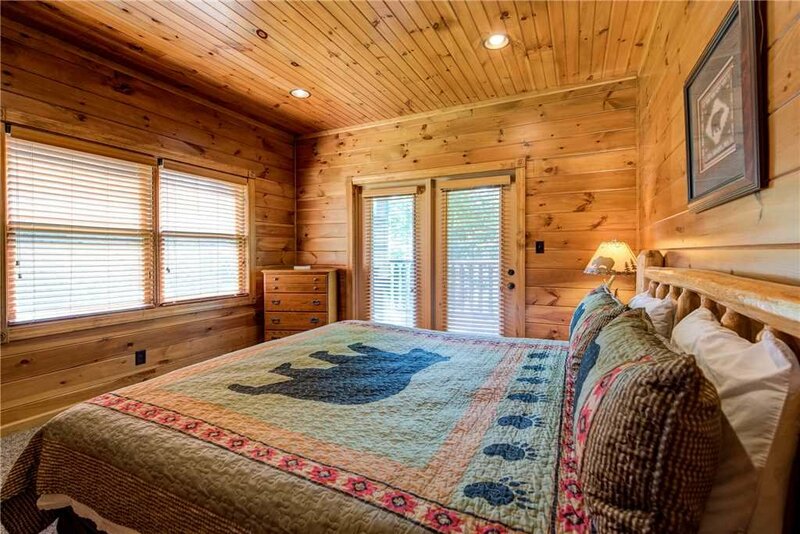 The main floor’s bedroom and one of the downstairs bedrooms have a private bathroom. 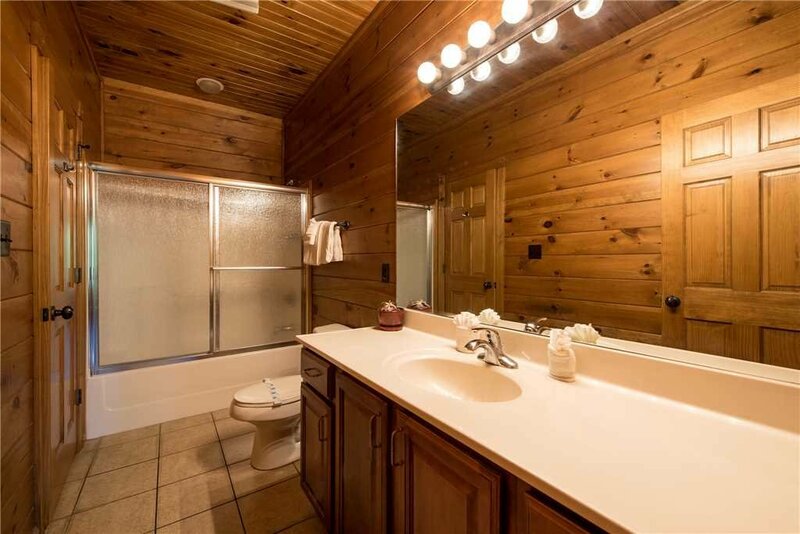 The third and fourth bedrooms share a spacious bathroom, and the fourth full bathroom is upstairs. 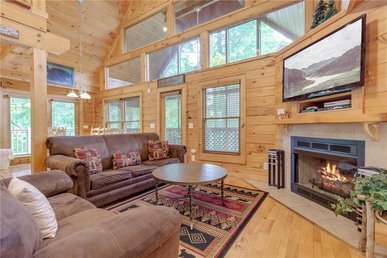 What’s more, the living room sofa converts into queen-size bed, so Gatlinburg Majesty can sleep up to fourteen people in all. 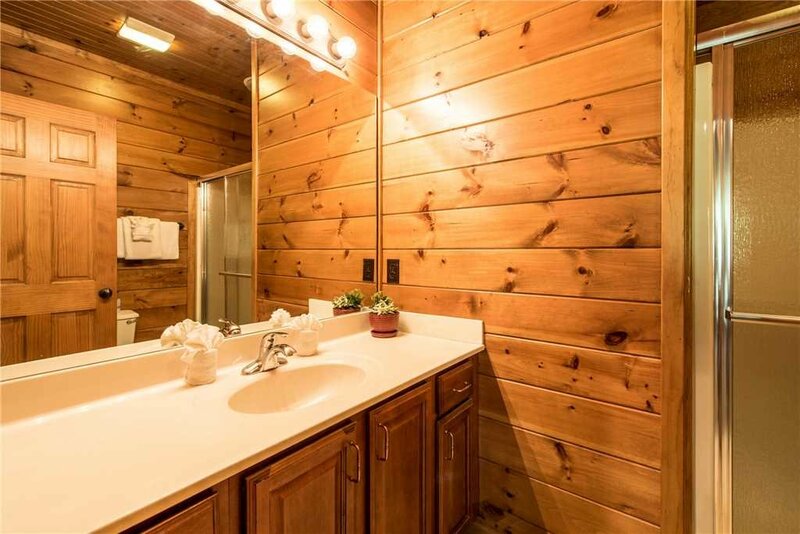 Among the cabin’s other amenities are free WiFi, cable channels, a washer and dryer, a park-style charcoal grill, and ample parking right outside. 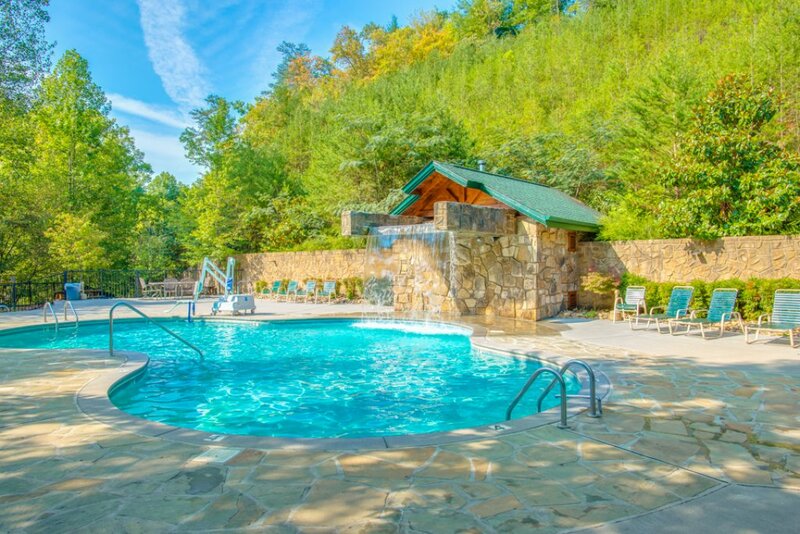 Another bonus: Because the cabin is located in the Gatlinburg Falls Resort, if you visit between Memorial Day and Labor Day, you’ll have free access to the resort’s outdoor swimming pool year-round. 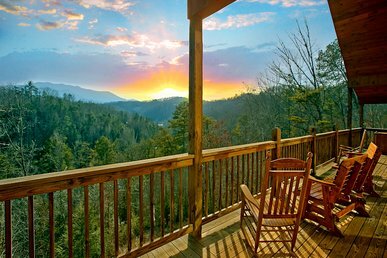 Perhaps best of all is Gatlinburg Majesty’s location. It’s close to just about everything the area has to offer. 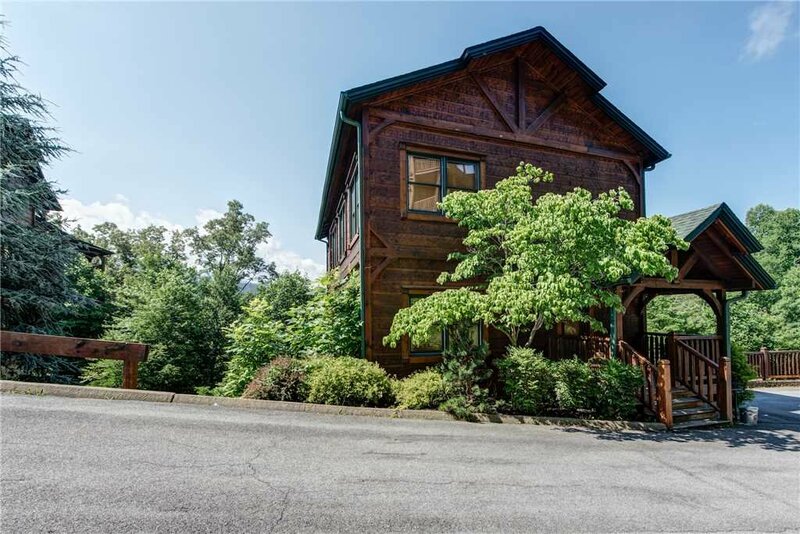 In no more than ten minutes, you can be at downtown Gatlinburg, home to the Guinness World Records Museum, thrill rides, an aquarium, and a tram that carries you over the town up to Ober Gatlinburg Ski Area and Amusement Park. Also, ten minutes away is the indoor/outdoor Wild Bear Falls Water Park. And let’s not forget the Great Smoky Mountains National Park, a true must-visit, and the attractions of Pigeon Forge, which include Dollywood. Treat yourself to the fun-filled vacation you deserve. 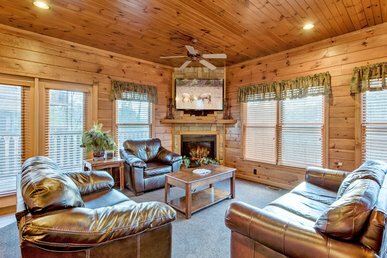 Book your stay at Gatlinburg Majesty today, and get ready to make memories that will last a lifetime. Great place for our group of friends! 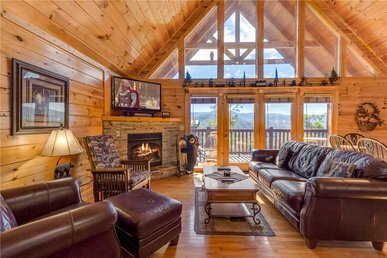 Our group of 4 couples had a great stay at Gatlinburg Majesty! 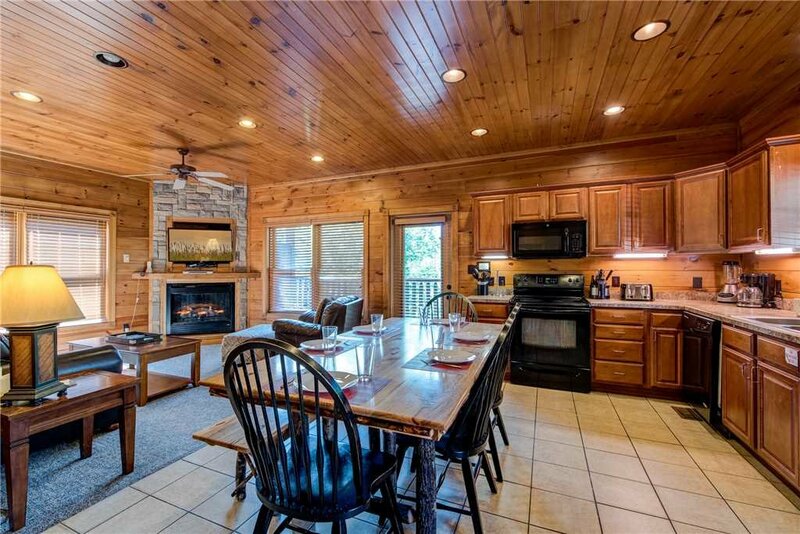 We are happy to hear that you and your group enjoyed your recent stay at Gatlinburg Majesty. Come back soon! 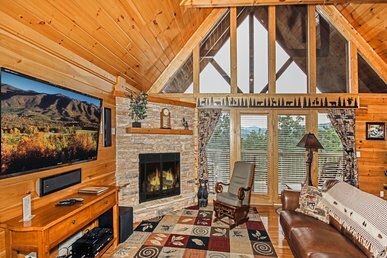 Our cabin rental, Gatlinburg Majesty, was very accommodating for our group of seven. 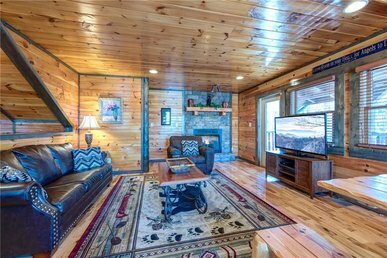 The cabin was clean and centrally located to downtown Gatlinburg and the Great Smoky Mountains National park. The top floor was very spacious and offered excellent games (arcade, pool, air hockey) for our groups entertainment. The only comment I would make for improvement would be to replace the couch on the second (main) floor as it was rather soiled. We are already making plans to return to this resort. Gatlinburg Majesty was perfect for our family. The main level had a kitchen/dining/living area and a king bed master bedroom with adjoining bathroom with tub/shower combo. 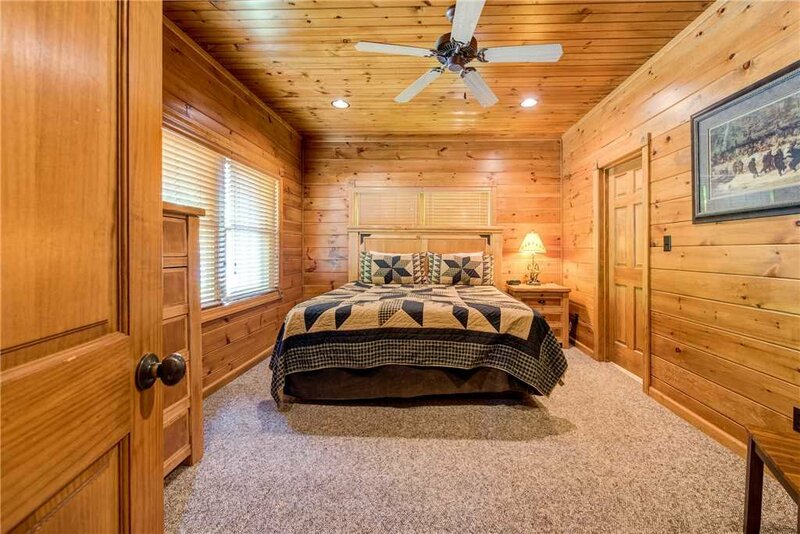 The lower level had 2 king bedrooms with a jack and jill bath (shower) and a 3rd king bedroom with private bath (shower). There was also a stacked washer/dryer. 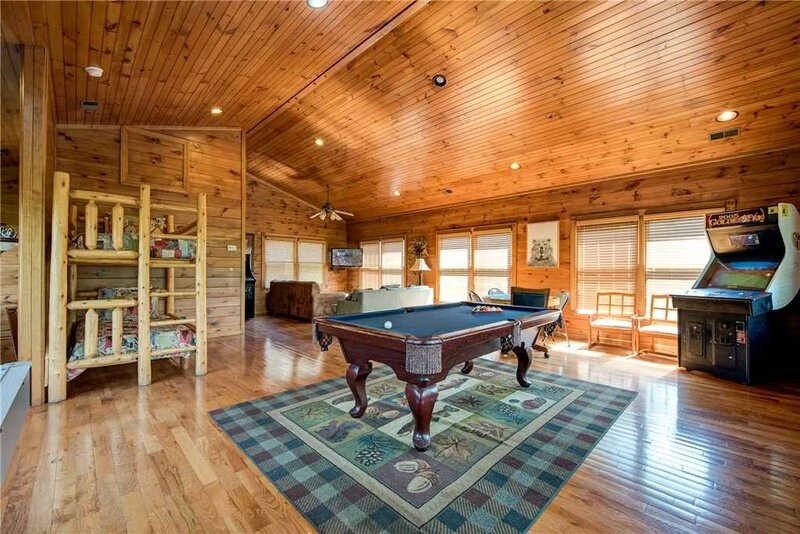 The upper floor was a large game room with a pool table, air hockey table, poker table, 2 different arcade games, a sitting area with television, a set of bunk beds and a full bathroom (shower). There are 3 decks with plenty of places to sit or swing. 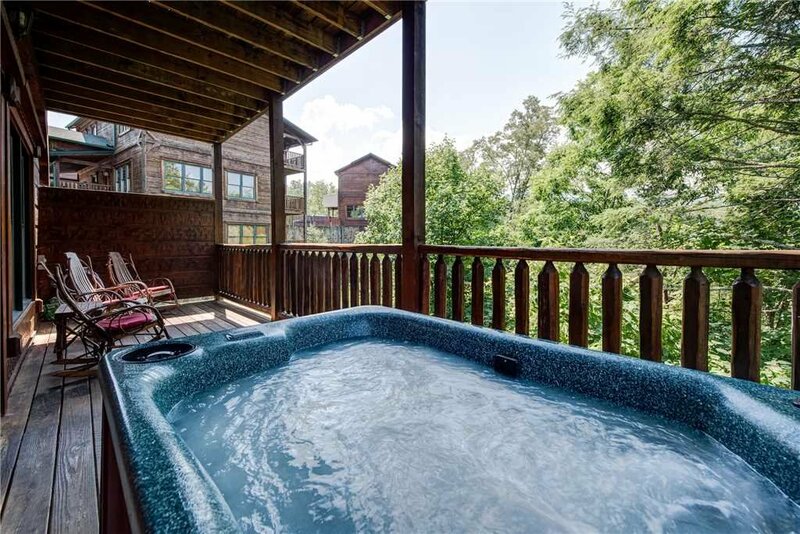 A hot tub on the main floor deck. 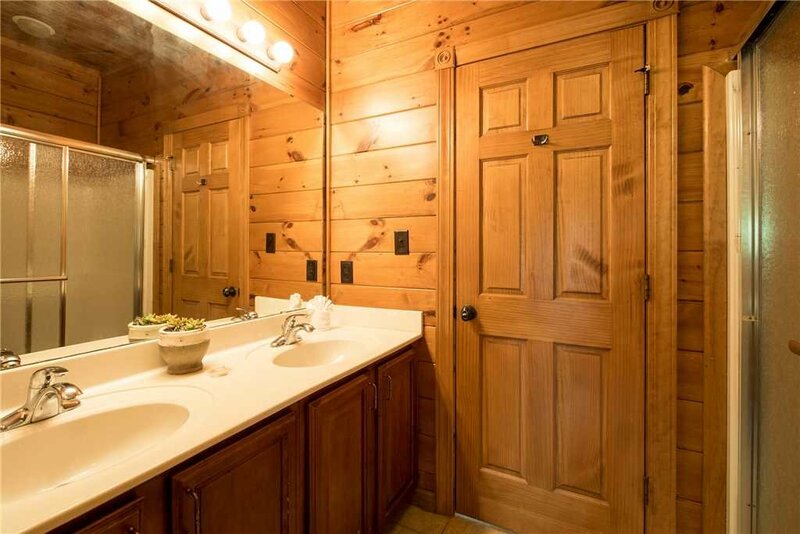 Located in Gatlinburg Falls among many wonderful cabins but you feel you still have lots of privacy. We loved it!!! It was great experience - the caving was really nice with all the required items in kitchen .. Maintainance support was quick . All great experience . Thank you for your review - we were upset to hear that you rated the property two-star and said it was only 'OK.' Is there something we could have done better for you and your group? The property had actually been upgraded in several ways prior to your arrival so I am disappointed that it was not what you were expecting. Please feel free to contact us directly with further comments. Overall we had a great time. 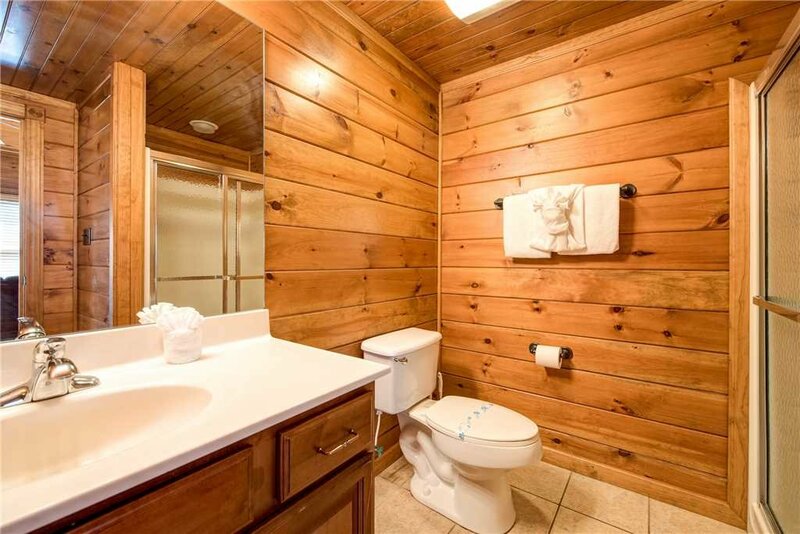 The cabin was nice. The game room was a big hit! The young people spent a lot of time there. It was a good location. The hot tub worked great. We enjoyed using it. Some things that could be improved: You could hear everything no matter where you were - more insulation. Hard to keep the lower level at a good temperature, it was too cold. Wi-fi was available but it was slow. Not a lot of pots and pans if you plan to cook a lot. The management was great. We needed a couple of things and we got them right away. We did enjoy our stay! Wish we could have stayed longer. I would definitely stay here again.Thank you! I usually don't give bad reviews. If I don't like it I usually don't say anything. But I spent so much money for one night and the problems could be fixed so here goes. The first problem was we didn't get to check in until 5 because of housekeeping. We booked it that day so I get that. The control know on the stove top was messed up and when put to the off position was on High. 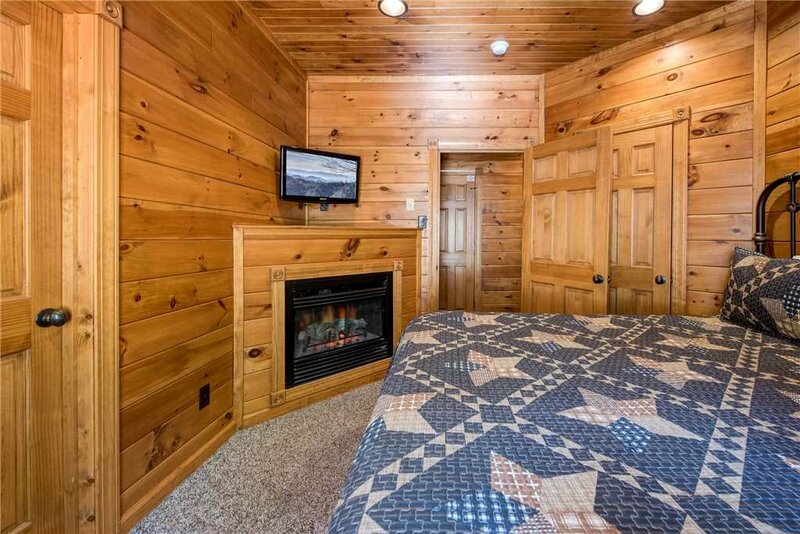 My main complaint about this cabin and the reason I would never stay again was the furniture. Every couch and every bed and pillow were hard as rocks and uncomfortable. The blankets on the bunk beds upstairs looked like they had never ever been washed. Nobody got any sleep. Sorta ruins the whole trip when you can't do what you made the trip for( which was take my 80 year old mom through Cade's Cove) because you're exhausted from lack of sleep. 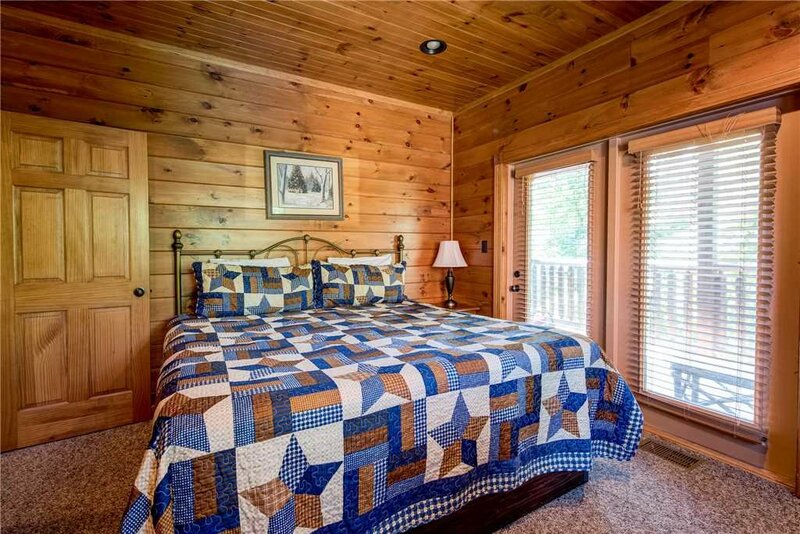 We've stayed in a lot of cabins and I'm not too picky about the beds, these were really that bad. The couches too. 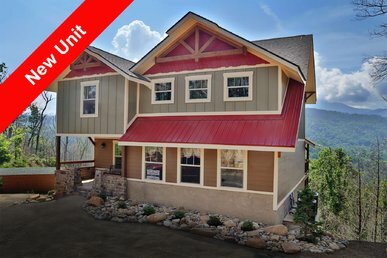 And the name on the cabin is Mountain Majesty not Gatlinburg Majesty. The directions were a little confusing and we got lost so I it would have been easier if we were not looking for a cabin with a different name. We finally just tried the door code on this one because it was in the area of the directions and had majesty in its name. The game room was fun. No view. It would be worth the owners while to replace the mattresses and couches and hire someone to trim the tops od the trees. They would have return guests if they did that. Thank you for your comments and the review! 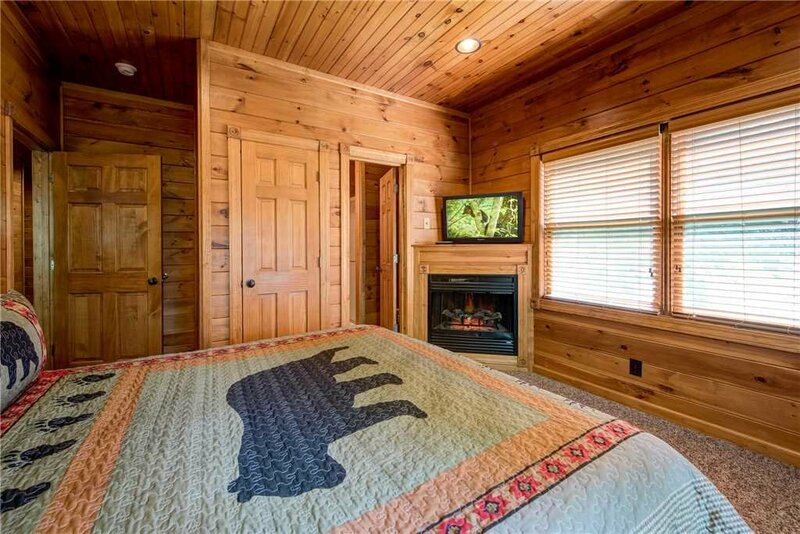 Even though the review was negative, it has helped us make our cabin better. We have replaced the furniture you mentioned (couches on the main level, mattress, and couch upstairs, and the dining room table). We are working with the HOA to trim the tree tops and hopefully will be able to do that soon. Thank you again for the review! As a family reunion site we had high expectations. We found the location fine. Since we had school age children in our group, we needed a little yard space for them to run off energy. The porches and road just didn't do. As for cleanliness,YIKES!! It was only ok in the living area but the upstairs floor was filthy. Our children's bare feet were just black on the bottoms! It needed a good mopping! We didn't have enough silverware for the 13 guests there and on the second day someone brought us enough for our group. We only had 6 towels for 13 people and by the end of the 2nd day we got lots of towels. We got our own towels from the pool area after we took a dip when we arrived to help out that situation. We thought that the wi-fi would be in working order as well. We had service on the first day and then it was up and running again by the 4-7th day. If I had to rate the cabin on a 1-10 with 10 the best I would give the cabin experience a 5.5. The view of the mountains were blocked by the trees so that was a disappointment as well. The kids did enjoy the pool area and it was close to a main road. We liked that each floor had its own air conditioning system. I don't feel the price we paid for the unit was worth it. There were too many view, unclean, not enough towels and silverware. The staff was nice enough but it took a while for us to get our needed things. Thank you for your feedback concerning your recent stay. I am sorry to hear that the property fell short of your expectations. Since your stay, we have addressed the issue with housekeeping, replaced kitchen items, and replaced some furniture. I am actually the one that came by on July Fourth about thirty minutes after you called to assist with the WiFi (your father was present). Unfortunately, the cable internet provider did have some outages during your stay. Thank you again for staying with us and come back soon! This rental agency was very friendly & pleasant to deal with. However, there were many disappointments with this property. All of the furniture is in bad need of replacement. It is all worn and outdated. Dining table only has 6 chairs. 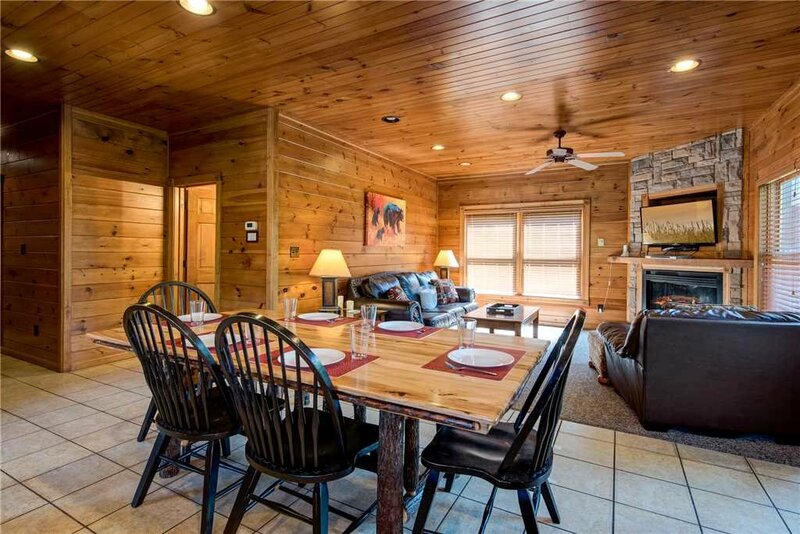 If this cabin was at full rental capacity (14 people), I have no idea where everyone would sit to eat. There are also only 7 drinking glasses in the kitchen & few dishes. We were constantly washing glasses in order to have a clean cup to drink from (we had 8 people). I bought brownie mix to make brownies for the kids and there was nothing in the kitchen to make them in nor were there any measuring cups. 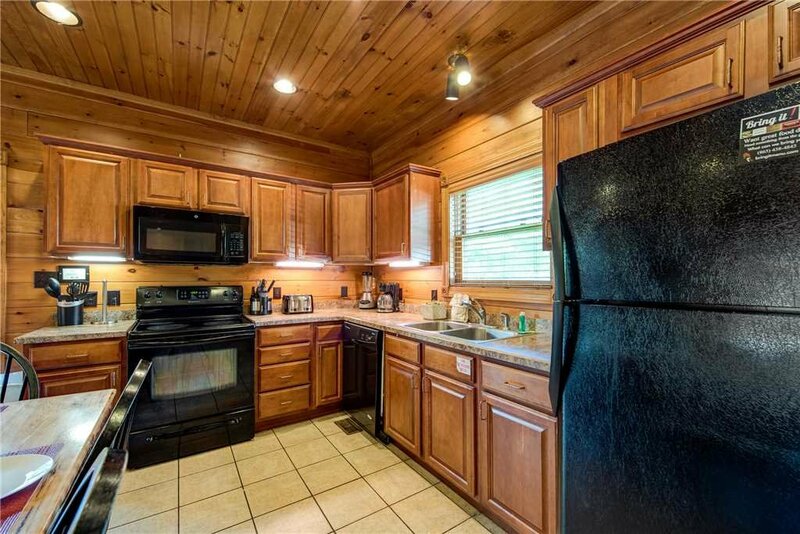 The cabin is very small & the downstairs is like being in a dark cave. Hot tub is small and would hold 3 people max. The pool table only had three que sticks that were useable because the others were missing the tips.Upon our arrival, the upstairs AC was not working. Called the rental agency and they did send someone within a couple hours to fix it. We also called because the ice maker did not make ice. 2 days later, I had to call back because no one had been out.The most disappointing thing about this cabin was that it was advertised as a mountain view and it is NOT. 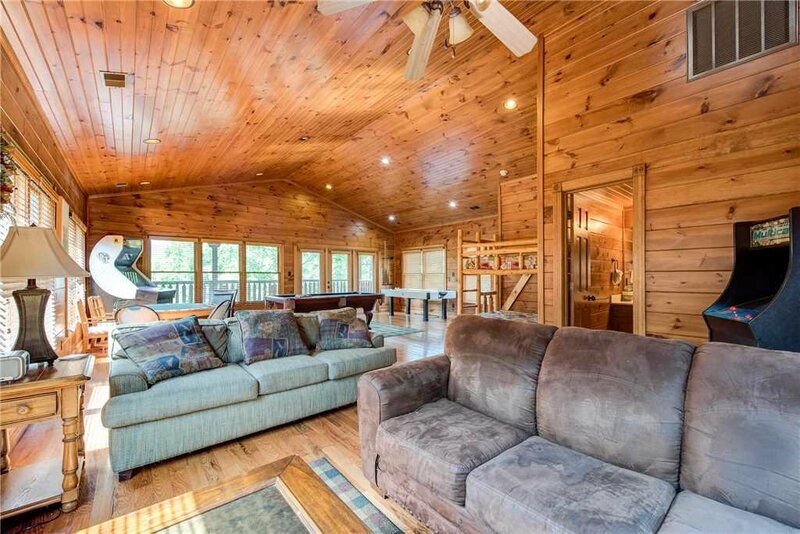 The view from all three decks is of woods and trees.